FAQ’s on Recent Changes to Healthcare Legislation Brandi Brock Chances are you’ve heard about the serious changes going on in the healthcare market. No matter how you feel politically, it is important to be aware of what the Patient Protection and Affordable Care Act means. The recent changes to the marketplace have left many consumers (and oftentimes providers!) with a lot of questions. We’ve found that many of our patients are a bit confused about what the legislation means for them, so we have assembled answers to some of the most frequently asked questions to help you understand how it may affect your health insurance. Q: What is “Obamacare”? A: The Affordable Care Act, often referred to as “Obamacare”, has left many of us confused about the terminology. It is important to note that “Obamacare” is not insurance, but legislation that enacted a lot of changes to the healthcare market. One of the changes includes developing a system to offer subsidies to assist individuals and families who qualify. The primary way to register for these benefits is through the government website, healthcare.gov. The insurance purchased through this online marketplace is often incorrectly referred to as “Obamacare Insurance”. Q: What kinds of plans are offered through the marketplace? A: Blue Cross and Blue Shield of Georgia is the primary supplier of plans sponsored by the Affordable Care Act for residents of Georgia, but Humana is another available option. No other insurance companies have subsidy plans available. Q: Can I register through healthcare.gov? It seems these plans are less expensive for me than what I have now! A: The healthcare.gov insurance plans are only available to those that do not have coverage through a group plan or employer. If you have the option to purchase through your employer (or your spouse does), you do not qualify for subsidies to these plans. Q: I don’t qualify for the plans, so what will this legislation mean for me? A: Likely, nothing. For most patients – those with Medicare, Medicare advantage plans, Medicaid, Medicaid sponsored plans, or group employer sponsored coverage – you’ll likely see little change. There are some small changes, such as the elimination of any lifetime or annual maximums for coverage or the inability for insurance plans to deny claims for a pre-existing condition. Also, you will now find that insurance companies cannot charge you more based on your gender or health status. However, most patients won’t notice a difference in how your plan operates. Q: I don’t have any insurance and I either don’t plan to register on healthcare.gov or am ineligible for those plans. What does that mean? Am I forced to have insurance? A: One of the regulations passed in the Affordable Care Act is a tax penalty for those that choose to not have health coverage. The fee, as it sits now, is 1% of your income or $95 for adults ($47.50 for children). There is a maximum penalty of $285 per family. For some families, paying the penalty may be cheaper than paying for coverage and care as self-pay. However, it is important to note that the family would not be insured or protected if a big emergency happened that caused severe medical bills. Q: What can Piedmont do to help me through these changes? A: Piedmont Orthopedic Complex is the only orthopedic practice in Macon that currently accepts patients with BCBS GA or Humana plans purchased through the marketplace. While we hope you never require orthopedic, podiatric, or other musculoskeletal care, we will be here for you if you need us. We also have a fully knowledgeable front desk and billing staff that can help answer your questions. Q: What if I have more questions? A: Piedmont’s team is more than happy to help you through what we can. However, it is important that you understand your own benefits. If you haven’t already, we encourage you to call the member services phone number on the back of your card to inquire about what benefits are available to you. It is best to inquire about not only what your benefits are for services and when a referral might be required, but also what free services are available. Most plans offer free preventative care and services beyond just well visits. We’ll do our best with generalities, but every plan is different. It’s important to have a good handle on what to expect for your services. 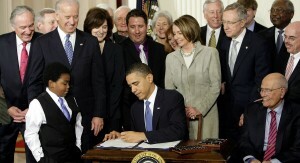 If you have additional questions about the law changes, the government operates a very helpful and clear website at: http://obamacarefacts.com/obamacare-facts.php. Brandi Brock is the Director of Billing at Piedmont Orthopaedic Complex.